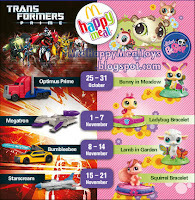 Say bye bye to mystery toys & let's welcome Transformers Prime & Littlest Pet Shop! 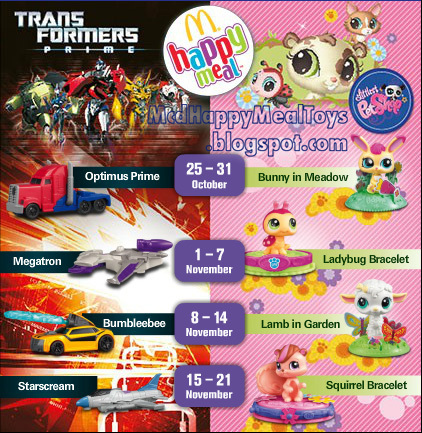 Starting from 25th October till 21 November 2012, Transformers Prime will be invading your lunch and dinner! Be on look out for Megatron who will be hiding at a corner blasting off your burger and Starscream flying over your head shooting at your fries! Afraid not as Autobots will be coming to the rescue! Optimus Prime and Bumblebee shall be ready to roll out and protect your precious meal! Too bloody robotic for you? You can get some cute animals to accompany you while enjoying Happy Meal if you do not want to start another war. With Bunny in Meadow, Ladybug Bracelet, Lamb in Garden and Squirrel Bracelet, you might secretly wish that they will accompany you to school or work everyday! Just make sure you didn't accidentally ATE them :D !